Professor Richard J. Povinelli, Ph.D. This course provides a broad exposure to intelligent systems, including related fields such as artificial and computational intelligence. Topics include intelligent agents, search, game playing, propositional logic and first-order predicate calculus, uncertainty, learning, communication and perception, and philosophical foundations of intelligent systems. This course is a COEN design elective in the area of intelligent systems and will be offered in the Fall semester of even-numbered years. Prerequisites: Data structures course (COSC 55 or 154); calculus 1 (MATH 80); discrete math (MATH 90 or 145). have a broad, general understanding of many of the areas that comprise the field of intelligent systems. evaluate the various definitions of AI. compare and contrast various agents including reflex, model-based, goal-based, and utility-based agents. evaluate a search algorithm on the basis of completeness, optimality, time complexity, and space complexity. compare, contrast, classify, and implement various search algorithms. evaluate, compare, and implement the minmax and alpha-beta algorithms, including for games of chance. compare and contrast propositional logic and first-order predicate calculus. analyze and employ logical inference in first-order logic. explain various probability constructs including prior probability, conditional probability, probability axioms, probability distributions, and joint probability distributions. apply and analyze decision trees to learning problems. explain the state-of-the-art in robotics and program robot using the algorithms covered in this course. use state-of-the-art programming and development tools for building AI systems. NOTE: All dates and numbers are subject to change as deemed necessary! 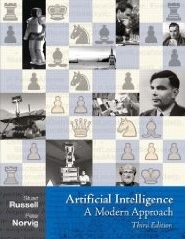 Artificial Intelligence: A Modern Approach (3rd Edition) by Stuart J. Russell and Peter Norvig, Prentice Hall, 2010. The grading scale is the most stringent one you will be held to, i.e. I can give you a higher letter grade than shown on the scale, but never a lower one. If you have missing assignments, you are inelligible to receive a higher grade. I will deduct 5% for assignments up to one day late, 10% for two days late, and 15% for up to three days late, and so on up to a maximum of 50% off. Assignments are due at the beginning of class. They are late after that. Assignments are not accepted after solutions have been distributed, nor after the last day of class. In class assignments are only accepted during the class period they are assigned. I have always enjoyed teaching classes where the students actively participate - a conversation is more fun than a monologue! Although there is no specific credit assigned for attending, it is still expected. There may be in class graded assignments. These may be turned in only during the class period they are given. You should expect to spend, on average, from twelve (6) to fifteen (9) hours on reading, homework, and other preparation for this class. This time is in addition to the three (3) hours of lecture you are expected to attend every week. All written portions of assignments must be created using a word processor. No part of the writeup may be hand drawn. The assignments are to be well written with proper spelling and grammar. Points will be deducted for poorly written assignments. Written portions of assignments must be turned in as MS Word documents (.docx format). Code and other portions must be submitted in the proper electronic format. I will deducted 5% from incorrectly formatted assignments. All assignments must be turned in via D2L. Assignments are due according to the the time specified in the calendar. There will be four (4) article reviews. This will help you understand the relevant literature for your research project. You will identify articles that are relevant to the course topic, if you are unsure of its relevance double check with the instructor. For each article you will write a 1 page summary and a 1 page critique. Critiquing others work is an excellent mechanism for improving your own. It is backbone of the peer review process. You will be expected to evaluating others work including critiquing others article reviews. There will be seven (7) homeworks, which will be collected and graded. The homework assignments will be scaled to 500 points. The homeworks will be combinations of questions from the book and programming problems. You must cite, using IEEE format, your references including online ones. There will be a midterm exam worth 200 points. There will be a final exam worth 300 points.